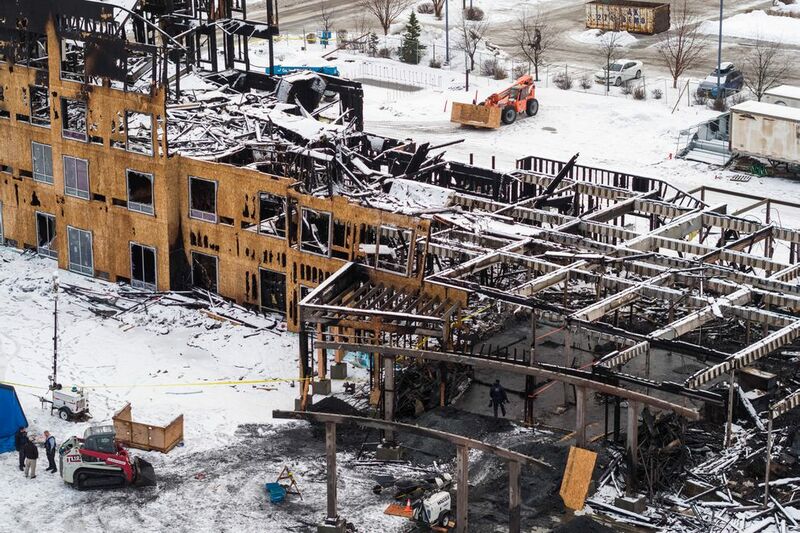 Fire investigators have no reason to believe the blaze that destroyed an unfinished hotel in Midtown Anchorage on Saturday was connected to previous fires at other unoccupied buildings, the Anchorage fire marshal said Wednesday. The construction site at 4960 A St., between Tudor Road and International Airport Road, was already partially engulfed when firefighters arrived on the scene just after 5 a.m. Saturday. The hotel was scheduled to open as a 141-room Courtyard by Marriott sometime in the fall, according to a company press release. The blaze took more than a day to completely extinguish. Fire investigators were finally able to enter the building Monday, though officials aren’t saying anything publicly about what was found inside. 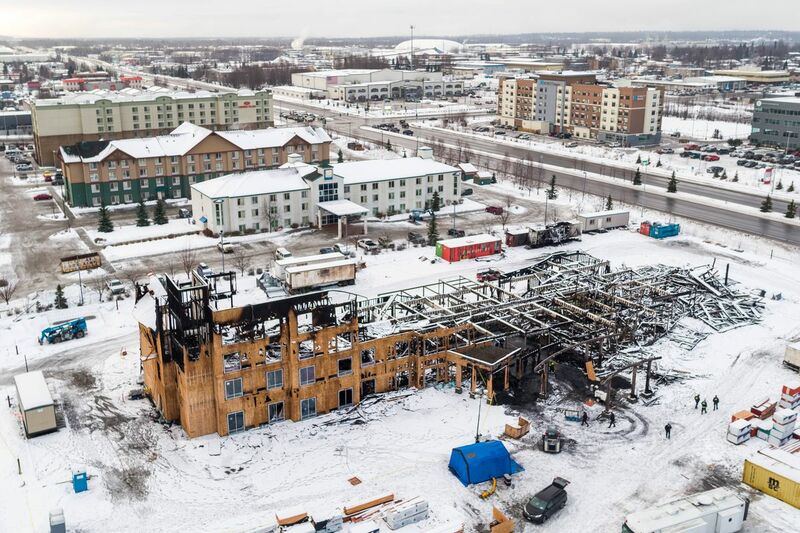 Fire investigators on Tuesday asked members of the public to notify the Anchorage Fire Department about any information related to the fire, including any smartphone or surveillance video that they may have captured. 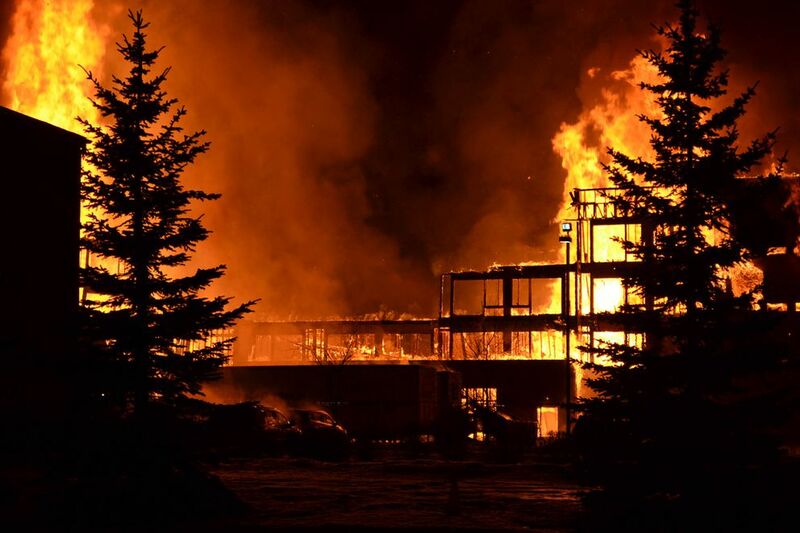 The hotel is at least the third unoccupied building in Anchorage to be destroyed in a fire within the last three months. In late November, a fire engulfed an abandoned home downtown, and another destroyed the former Sea Galley restaurant in Midtown earlier this month. Anchorage Fire Marshal Cleo Hill said no data was immediately available about how often fires happen in unoccupied structures — and whether these three fires represent a spike — but she doesn’t believe they’re connected. Hill said that people she called “vagrants” had been inside the shuttered Sea Galley shortly before the fire there started. A neighbor who lives near the home that caught fire said he’d seen homeless people in the yard of that building, as well. Anchorage police spokeswoman Renee Oistad said officers have responded to at least two break-ins at the construction site within the last three months. The first involved a man who was apparently intoxicated, though police were not able to locate him when they arrived at the scene, Oistad said. Then, in December, police arrested a woman after she reportedly tried to break into one of the site’s construction trailers. She wasn’t able to enter the trailer or steal anything, and was later released after the company developing the property decided not to press charges against her, Oistad said. The Sea Galley, which was less than half a mile away from the unfinished hotel and burned down about three weeks prior, had also been broken into twice before it burned. Hill estimated the losses to be about $20 million, a number she said she arrived at after speaking with the construction superintendent. It isn’t clear yet whether the developer, Affinity Hospitality, will continue to pursue the construction project. Attempts to reach developer Ric Marko were unsuccessful Monday.